Experience the latest in a distinguished bloodline. The F‑TYPE range offers sports cars that only Jaguar could create — effortless performance and precise agile handling, with everyday refinement and usability. From its long hood to its wide rear haunches, the F-type is one slinky stunner. Offered as either a coupe or convertible, this descendant of the iconic E-type sports cars of the sixties and seventies drives almost as good as it looks, with sharp handling and up to 400 supercharged horsepower from its V-6. But it’s also comfortable enough to satisfy those who’d rather cruise languidly, luxuriating in the F-type’s well-appointed interior while appreciating the admiring glances of passersby. 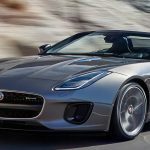 The standard F-type, available as a coupe or convertible with a choice of a turbocharged inline-four or one of three supercharged V-6s, is quick—fast, even—and can hold any driver’s attention through curving back roads. But it’s not as brisk or as dynamically proficient as many other cars in its class. To match their speed, you’ll have to shell out big for the wicked R and SVR models, with 550 and 575 horsepower, respectively, from their supercharged V-8s. They are reviewed separately. Sheer horsepower aside, the F-type possesses one of the most distinctive and appealing exterior designs in recent memory and a cackling exhaust note that ensures heads will turn to notice both the car and its driver.